If you are a new graduate, you just graduated college, this video is for you. If you didn’t, get on out of here; unless you just find my videos to be entertaining, stick around, maybe you’ll learn something. Anyways, today, we’re focusing on new graduates. And the biggest problem new graduates have is they fail to connect the dots for employers and show them why they qualified. That’s right; they fail to connect the dots. So, what the heck does that even mean? Well, stick around because I’m going to show you in this video and will show you how you can be more relevant to employers and give them what they’re looking for. But one of the biggest problems new graduates have is they don’t know what they want. That’s right. They graduate from college and they don’t know what they want. They leave it up to employers to figure out what they want. I know this because I’ve gone out. I’ve gone out to several colleges here in the Cleveland, Ohio area and I’ve interviewed graduates and they like, “Well, maybe I’ll send my résumé out and see what employers think I’m good at doing. Seriously, they do that. And you know what happens, when an employer gets a résumé from somebody that says, “Hey, can you tell me what I’m good at doing?” They take that résumé, and they crumple it up, and they throw it in the trash. So, don’t be one of those. Make sure you know what you want. Make sure you know what you’re looking for. And that’s the problem recent college graduates have is they fail to connect the dots for employers and show them this link of events as to why they’re qualified for this job and what they can do for an employer. And I know this to be true. After they’ve graduated or they’re going to graduate, they don’t know what they want. They don’t know what they want to do, they don’t know what they want to be, and they try to leave this up to the employer to figure out what they’re good at doing and they kind of hope that that employer will offer them a job in their company. But it doesn’t work that way. You have to know what you want to be doing. You have to connect the dots for the employer. You have to show them why you’re qualified, why you’re a good fit. So, how do you do this? I mean, if you’re a recent college graduate, you have more work to do than everyone else. I mean, you don’t have the years of experience that other professionals have. So, you have a lot more work to do to show an employer why you’re a good fit, why you’re going to work out, why you’re qualified, why and how you can help them solve problems in their organization. So, you have to connect the dots. It all comes back to connecting the dots and you have to show them why you’re a good fit and how you’re going to be able to do this. I mean, think about it for a minute, of all the recent graduates hitting the job market. I mean, I don’t know if it’s 10 thousand or 50 thousand candidates hitting the job market every year. If you don’t stand out from that pack of 50 thousand candidates, you’re going to blend in. And if you blend in with 50 thousand people, you’re going to look like everyone else. And if you look like everyone else, you better get used to sitting on the sidelines because no one’s going to hire you. If you look like everyone else, if you look like all the other people competing for the same job, you’re going to blend in and blending in is the worst thing you can do. Employers can’t stand it when people blend in because they all look the same and it makes their job a lot harder to pick somebody who they think is a good fit for that position. So, blending in is your worst enemy. You have to be different. You have to stand out. You have to show them that you are different. So, how do you show then you are different? You don’t have any experience, you just graduated college. Well, you do. You have more than you think. I mean, unless you were just a bomb sitting around through college and you did nothing, then you’re really going to have a hard time. But I know that’s not you because you’re here and you’re watching me today and people who sit around and do nothing, they don’t have the motivation to go out and make themselves better like you are trying to do today. Like you are trying to figure out how you can be better, how you can be more relevant to an employer. I know that because you’re here watching me today and other people who are lazy, they don’t watch me, they just pray and they send out their résumé and pray. So, you have more to offer and I know that. I know that about you. So, what you have to do. You have to dig deep inside and find out what that is that you have to offer and I’m going to give you some examples. So, let’s say for example that you went to college for computer science; very common thing. Computer science and you’re looking for some type of software programming position. How are you going to differentiate yourself from everybody else who has computer science degrees and is looking for a software developer position? Well, hopefully, you have been doing some extra work. Hopefully, you’ve been doing some side work for yourself. Maybe you’ve been doing some programming at home, maybe you’ve been doing some programming for friends, maybe you make some websites for teachers, maybe have a little Fiverr gig and you do some programming for people. You’re active, you’re not making much money out it, maybe not even making anything. But it’s part of you, it’s inside of you, it’s who you are. You are a programmer or you’re a developer, you’re a thinker. And you’ll demonstrate this, you’ll show this in the interview. You’ll talk about that experience. I mean, just because you didn’t get paid for it, just because it wasn’t a full time job doesn’t mean it is an experience. And when you go in to an employer and you show them this relevancy that you went to school for computer science and these are the things you did in your curriculum and then outside of your curriculum, extracurricular activities, you show them that you were involved in maybe some clubs, maybe some programming clubs, web clubs, show them that maybe you did some websites for some people on the side, maybe a Fiverr gig. All these shows energy and passion for who you are and what you do. This is going to make you a lot more relevant. So, if an employer has 10 candidates in front of them and they all have computer science degrees, only one or two are going to stand out and shine as going above and beyond having that degree and showing those extracurricular activities, maybe volunteerism, sideline freelance work, whatever. That’s going to show more relevancy, that’s going to get you the edge, that’s going to differentiate you from everyone else. And it just and it doesn’t have to be computer science. I mean, I could take this example and go with accounting. Let’s say you’re an accounting major. Totally 180 from computer science. So, how do you show relevancy with all the other accountants hitting the job market? Well, because you were better than everyone else. Maybe you did the books, maybe did the accounting books for your local church, maybe you ran an accounting club in school, maybe around a little a finance club in school or maybe had some really good internships at some accounting firms, maybe you ran the books for your local PTA, the Boy Scouts, the Girl Scouts, whatever or maybe you ran ­­­the books for your grandmas cookie shop and you kept your accounting practices in order, whatever. That shows relevancy to your chosen career path. That shows that you went above and beyond what you did in college and you practiced what you learned in the real world. Again, maybe you didn’t get paid for it. It doesn’t matter. You’re showing relevancy, you’re showing that you have more experience than everyone else. So, again, then interviewer is sitting down there and looking at 10 résumés from 10 different accountants and they all have accounting degrees, but you know what? You stand out because you showed that you worked at the church and you ran your church’s books or you ran your grandmas cookie shop books, whatever it is. You’re going above and beyond everyone else. You’re differentiating yourself from everyone else and you’re connecting the dots and you’re showing employers that hey, because I did these different things and I went to school for this, this is why I think I’m qualified to do this work for you. Same thing with the computer science degree. “I went to college for Computer Science. These are the things I did there. These are the extracurricular things I did. And this is why I think I can do this (whatever that is) for you and here’s how I can do it”. You’re connecting the dots and you’re showing employers why you’re qualified. It doesn’t work that way. There’s way too many people in the job market looking for jobs and most of them spend most of their time looking because nobody wants to hire them because those people don’t know what they want. They don’t sharpen their skills enough. They don’t sharpen the focus. And that’s where you are going to have some work to do. You’re going to have your work cut out for you because you don’t have all that experience. You have to take what little bit you have, what little bit of college you have and what little bit of extracurricular activity experience you have and you’re going to have to lead with that. And that is going to be your edge, that’s going to be your edge to get in there, to get an entry level position and to get started. But you cannot just go in to an employer and say, “What do you think? What do you think are my stuff? You want to hire me?” No. Wrong approach. Don’t do that. Okay? So, in your next interview, go out there, show them who you are, be unique, be different, stand out from the crowd, show them that there is more to you than meets the eye and meets the paper. Show them that. Show them that you are a real, living, breathing person and you are passionate about what you do. Deliver that message. Don’t just give them a boring, dry interview like this, because that’s the fastest way to sitting at home, on the couch, without a job. All right my friend. Now, you know exactly what you need to do. So, go out there and your next interview, connect the dots for the employer. Show them why you were a good fit. Show them that you can be a valuable asset to their organization. Show them that you are passionate about what you do. And make yourself attractive to them and they’re going to become hungry for you. They’re going to they’re going to want to bring you into their organization because you have so much passion, fire and energy that you are going to breathe new life into their organization. And that’s what they want because that is going to help them grow. So, go out there, connect the dots and help them grow. I guarantee you won’t be sitting on the sidelines without a job for long because employers are going to just be drawn to you like a magnet. Seriously. All right my friend. Now, one of the things you’re going to have to do in your interview is you’re going to have to prepare yourself for a lot of the different questions that they’re going to ask you. And because you’re not used to interviewing, you just graduated from college, you’re not going to be familiar with what to expect. So, that’s why I’ve got The Complete Interview Answer Guide. This book here has been around for over 10 years. I keep it up to date all the time. This has over 150 different questions and it covers behavioral questions, common interview questions and it’s going to show you the way that employers are expecting you to answer their questions. It’s going to teach how to do it, whether you’ve got 20 years of experience or no experience at all. 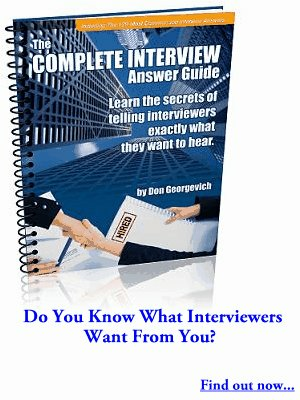 This guide, The Complete Interview Answer Guide, is going to teach you the right framework to use when answering any type of interview question. And this this is an easy download it’s the PDF book. You can get it on hardcopy too, its in audio and video. You can get it from jobinterviewtools.com. It’s like 47 bucks. It’s well worth your time and money to just try this book. It’s also got questions that you can ask the interviewer, because it’s important that you ask your interviewer questions too. Because you need to ask them questions to find out if this is the right place that you want to be at. And this book is going to teach you the right types of questions that you can ask an employer. It’s going to help you figure out whether they’re a good enough employer for you. So, go out there, connect the dots for employers. Show them why you’re a good fit. Differentiate yourself from all the other people out there looking for jobs. And I just guarantee you that you are not going to be unemployed for long. All right my friend, good luck on your next interview and I will see you in the next video. Bye now. If you found this video helpful, then give it a thumbs up and make sure you subscribe to my channel. So, you get notifications every time I release a new video. And by subscribing, you support me, my message, and this channel. So, I’d really appreciate it. Make sure you hit ‘Subscribe’.